A Tupilaq is an avenging monster that can be made by someone against an enemy. They were made of natural materials such as hair, bone, leaves etc. in secret isolated places and then after suitable chanting was cast into the sea to seek and attack the enemy with an intent to kill them. As avenging monsters go however there was a degree of egalitarianism involved in that if the enemy was more powerful (in a magical way) than the aggressor, then he/she could turn the tupilaq back against the maker, so you had to be pretty confident. There are no original tupilaqs left at all as they were made of natural perishable materials and cast into the sea, they were also not intended to be seen by any other person. 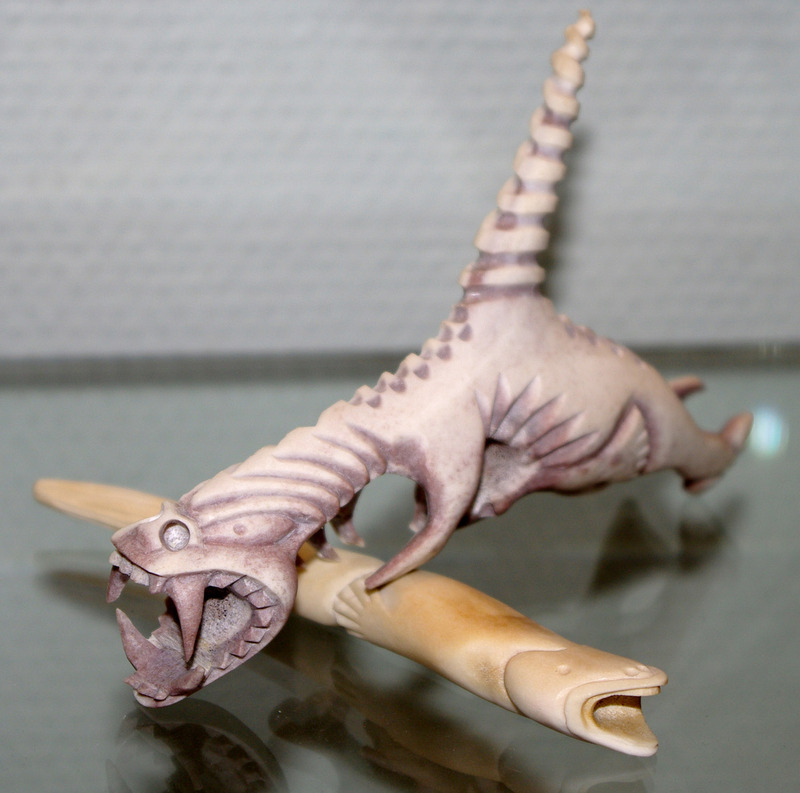 When Europeans went to Greenland, they were curious about what tupilaqs looked like, so some Inuit carved figures using materials such as whale tooth and bone, reindeer antler or narwhal tusk which the tourists would buy. Some of course would sell better than others and so designs became more fanciful and grotesque. Tupilaq carving became a highly skilled activity after a start where they were quite stereotyped. They are also somewhat curious in that they are probably quite different to what they were originally, now being finely detailed carvings in hard materials instead of being made of hair, skin, feathers etc. that would have presumably been significantly simpler and probably quite different as each person making one wouldn't have seen many or any others. Despite their "made for the tourists" origin, modern tupilaqs are individually hand made with very high degrees of artistic skill and craftsmanship.